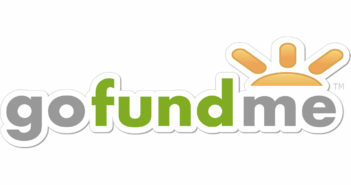 We are often asked if it is better to organize a reunion with or without professional help. Our response suggests that the decision should be up to each reunion because it depends upon whether or not you have the time and energy to do a thorough job. There is much detail and many considerations over a long enough period of time so a serious commitment is called for. We asked Debby Pattin, a partner in Reunions Unlimited, Olympia, Washington, and chair of the Ethics Committee for the National Association of Reunion Managers, to tell us why to use a professional reunion manager. Professional reunion managers have the experience and offer a comprehensive set of services and expertise to make your class reunion a success. Just think about how much time it would take to locate alumni, organize events, prepare and mail announcements and registrations and coordinate registrations and confirmations. Professional managers know how to find classmates, the most difficult task of reunion planning and provide one place of contact for consistent and up-to-date information. Professional mangers also pay up front costs, maintain web sites for secure on-line registration, provide toll-free phone numbers, e-mail and fax and credit card processing, deposit and bill paying. Then, consider music and photography, memory books, contacting local media, the school and alumni association, staffing events and paying for liability insurance. Professional managers take care of all those details and much more. Here’s the best part: there is no cost to the committee for using a reunion manager. Managers take the hassle out of planning a reunion and allow the committee to take the credit and have fun. Members of the National Association of Reunion Managers follow strict industry standards and adhere to a code of ethics. They have strong working relationships with hotels, banquet facilities, caterers, DJs, vendors and suppliers. Best of all, your reunion committee always maintains decision-making power while working with a professional. Like everything else, it is important to shop around and ask for and make reference checks for any potential manager. 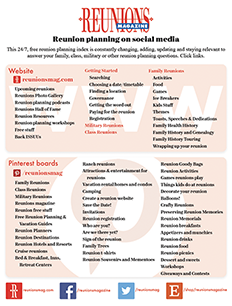 For information about a professional reunion manager in your area, visit the National Association of Reunion Managers website www.reunions.com or call 800-654-2776. Debby Pattin and her partner, Carol Riley, own Reunions Unlimited, PO Box 11203, Olympia, Washington 98508; 360-866-8842 or e-mail reunions@reunionsunlimited.com. Kimberly Peterson wrote, “I am trying to set up my high school’s ten-year reunion and I don’t know where to start. I want to find the right company to do it but I am not sure I even know the right questions to ask. How can you tell good companies from bad? What can I expect a good company to do and for what price? Is there a good place look for this information? Paula Sheagley* responds. Start with your local school district(s). Call a high school and ask them which company(ies) are reputable and stay in good communication. Professional reunion planning companies should register each reunion with schools and operate on good working terms with the local school offices/alumni associations. Entertainment. The first thing you should do is start talking to your classmates about who they work for and who they know. A lot of times we find that someone owns a company that has something we can use or knows someone that they can talk into donating a service or selling it to us at cost. Possibilities include Casino Nights, magicians that go table-to-table, a comedian during dinner, or just a fun icebreaker game. Local libraries offer books that describe hundreds of party games. Ask for references from the company. Then, call the references. Ask references to be candid about the good and the “bad” of working with that company. How do I find a reunion manager? 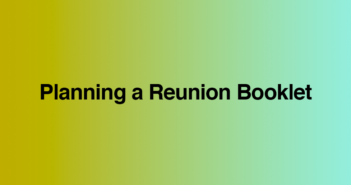 Locate reunion managers in your area at www.reunions.com. Click on “Reunion Planning” (in the left sidebar), click on “Locate a NARM Planner,” then click on the state where your reunion will be held. Contact any of the companies listed for details.